Hard rock band Cibola Junction was formed in late 2010 in Sweden and has recently released the single 'Peace Out', which is available at online music stores and services including iTunes and Spotify. 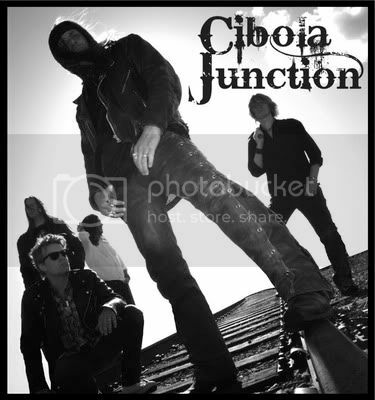 Cibola Junction consists of former MORGANA LEFAY lead singer Charles Rytkonen, together with Torsten Bengtsberg (guitar) and Magnus Soderblom (guitar). The rhythm section is represented by Orjan Josefsson on bass and ex-BABYLON BOMBS drummer Svante Hedstrom. According to a press release, Cibola Junction's desire to go back to the roots can be heard as an influence from the 70’s hard rock, but with innovative ways of thinking. Some call their music power groove others retro hard rock. “We believe it’s a kind of rootless music, yet there is something new. But if you going to put a label on it, it’s hard rock,” Cibola Junction declares. The band decided to put 'Peace Out' as a single witch resulted in collaboration with Chris Laney (best known as a songwriter and producer who have worked with amongst others CANDLEMASS, EUROPE and CRASHDÏËT) who showed interest for mixing 'Peace Out'. More songs will be recorded continuously and may result in a full length album. For more details visit Cibolajunction.com.